لاریجانی, شمیم, سالاریان, محمد, علیزاده, امین, داوری, کامران. (1395). تحلیل روند تغییرات تبخیر - تعرق گیاهی در شهرستان اصفهان (مطالعه موردی گندم). نشریه آبیاری و زهکشی ایران, 10(5), 674-686. شمیم لاریجانی; محمد سالاریان; امین علیزاده; کامران داوری. "تحلیل روند تغییرات تبخیر - تعرق گیاهی در شهرستان اصفهان (مطالعه موردی گندم)". نشریه آبیاری و زهکشی ایران, 10, 5, 1395, 674-686. لاریجانی, شمیم, سالاریان, محمد, علیزاده, امین, داوری, کامران. (1395). 'تحلیل روند تغییرات تبخیر - تعرق گیاهی در شهرستان اصفهان (مطالعه موردی گندم)', نشریه آبیاری و زهکشی ایران, 10(5), pp. 674-686. لاریجانی, شمیم, سالاریان, محمد, علیزاده, امین, داوری, کامران. تحلیل روند تغییرات تبخیر - تعرق گیاهی در شهرستان اصفهان (مطالعه موردی گندم). نشریه آبیاری و زهکشی ایران, 1395; 10(5): 674-686. تغییرات اقلیمی یکی از مشکلات امروزه بشر است و تهدیدی برای کره خاکی به حساب می‌آید که شناسایی و پیش­بینی عناصر آن در جهت مدیریت شرایط بحرانی اهمیت بسیاری دارد. در این تحقیق روند تغییرات زمانی پارامتر تبخیروتعرق برای محصول گندم همراه با بررسی روند تغییرات زمانی پارامتر دما در شهرستان اصفهان مورد بررسی قرار گرفت. بدین منظور از داده‌های هواشناسیایستگاه هواشناسی سینوپتیک اصفهان با دوره آماری 47ساله (2010-1964) استفاده گردید و با بکارگیری آزمون‌های پارامتری تحلیل رگرسیون و غیرپارامتری من-کندال، وجود روند معنی‌دار برای سری‌های زمانی ماهانه و سالانه در سطوح معنی‌داری 95 و 99 درصد مورد ارزیابی قرار گرفت. نتایج این تحقیق نشان داد که روند تغییرات زمانی تبخیروتعرق گندم، کاهشی بوده است. بیش­ترین موارد معنی‌داری روند تبخیروتعرق ماهانه در ماه‌های تیر و خرداد مشاهده شد ولی در مورد افزایش دما روند معنی‌داری مشاهده نگردید. در سری زمانی با مقیاس سالانه، تبخیر و تعرق با شیب حدود 29 درصد روند نزولی معنی‌داری در سطح 99 درصد نشان داد، ولی روند افزایش دما معنی‌دار نبود. مقایسه نتایج حاصل از بررسی روند تغییرات تبخیر و تعرق و دما توسط هر دو آزمون مبین این موضوع است که پدیده تناقض تبخیر در شهرستان اصفهان وجود داشته است. Climate changeisone ofhumanity's today problems andis considered as a threat tothe planetso Identifyandpredictits elements, is very importantfor themanagement of crisis situations. Inthis study thetime variationprocess ofthe evapotranspiration parameterforwheat crop, along withthetemporal changesoftemperaturein Isfahancity, was studied. Therefore,data fromsynopticweatherstationsofthe47-year period(1964-2010) were usedandwith usingparametric, RegressionAnalysis and nonparametric,Mann-Kendall tests, significant formonthly and annualtime seriesof95and99percentsignificancelevelswas evaluated. The resultsshowed thatthetemporal variations ofevapotranspirationof wheathave been declining. The mostsignificantmonthlyevapotranspirationtrendwas observedinJuly andAugust, althoughthere was no significanttrendofincreasing temperature. Based on theannual time series, evapotranspirationshowed a significantdownward trendinthe level of 99percent, with a slopeof about29%, however,thetemperature increasewas not significant. Comparing theresults ofbothevapotranspirationand temperaturechangesby bothtestsindicatethatthisphenomenon ofevaporationparadoxexistedinIsfahancity. قهرمان،ن.. قره خانی،الف. 1390. 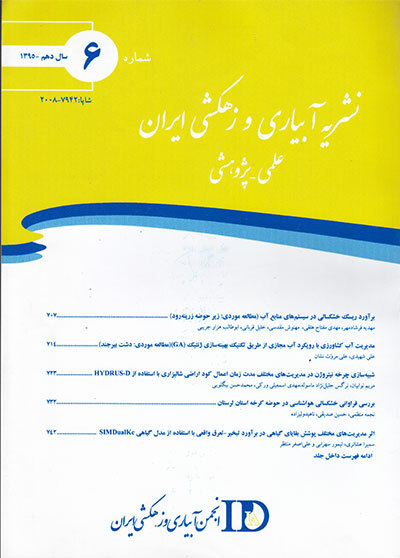 تحلیل متوسط سرعت باد در شرایط اقلیمی متفاوت در ایران. مجله آبیاری و زهکشی. 1 .4: 31-43. Allen,R.G and Pruitt,W.O. 1991. FAO-24 Reference evapotranspiration factors. Journal of Irrigation and Drainage Engineering. 117.5:758-773. Balling,J.R.C., Idso,S.B.1990. Effects ofgreenhouse warming on maximum summertemperatures. Agricultural and Forest Meteorology., 53, 143–147. Chattopadhyay,N and Hulme,M. 1997. Evaporation and potential evapotranspiration in India under conditions of recent andfuture climate change. Agricultural and Forest Meteorology. 87: 55-73. Croissant,R.L., Peterson,G.A and Westfall,D.G. 1998. Dryland Cropping Systems.Colorado State University, Cooperative Extension. Bulletin No. 0.516. Gharehkhani,A., Ghahreman,N and Bazrafshan,J. 2012.Trend analysis of pan evaporation in different climates of Iran, Watershed Management Research (Pajouhesh&Sazandegi) No 98 pp: 85-97. Jhajharia,D.,Shrivastava,S.K., Sarka,D and Sarkar,S. 2009.Temporal characteristics of pan evaporation trends under the humid conditions of northeast India. Agricultural and Forest Meteorology. 149: 763–770. Lawrimore,J and Peterson,T. 2002. Pan Evaporation trends in dry and humid regions of the United States. Journal Hydrometeor,. 14-31. Li,Z.L., Xu,Z.X., Li,J.Y., Li,Z.J. 2008. Shift trend and step changes for runoff time series in the Shiyang River Basin, Northwest China. Hydrological Processes .22:4639–4646. Ohmura,A and Wild,M. 2002.Is the hydrological cycle accelerating. Science. 298: 1345-1346. Roderick,M.L and Farquhar,G.D. 2002. Changes in Australian pan evaporation from 1970 to 2002. International Journal of Climatology, 24, 1077-1090.. Stanhill,G., Cohen,S. 2001. Global Dimming: A review of the evidence for widespread reduction in global radiation with discussion of its probable causes and possible agricultural consequences. Agricultural and Forest Meteorology, 107: 2555-278. Tabari,H., Marofi,S., Aeini,A., Hosseinzadeh,P., Mohammadi,K. 2010. Trend analysis of reference evapotranspiration in the western half of Iran. Agricultural and Forest Meteorology. 10:116-125. Tonkaz,T., Cetin,M and Tulucu,K. 2007.The impact of water resources development projects on water vapor pressure trends in a semi-arid region, Turkey. Journal Climatic Change 82: 195-209. Tavakoli,A.R., Oweis,T., Ashrafi,Sh., Asadi,H., Siadat,H., and Liaghat, A. 2010. Improvingrainwaterproductivity with supplemental irrigation in upper Karkheh riverbasin of Iran. International Center for Agricultural Research in the Dry Areas(ICARDA). Aleppo. Syria. 123pp. Thomas,A. 2000. Spatial and temporal characteristics of potential evapotranspirationtrends over China. International Journal of Climatology. 20: 381–396. Yaning,C., Changchun,X., Xingming,H., Weihong,L., Yapeng,C., Chenggang,Z., Zhaoxia,Y. 2009. Fifty-year climate change and its effect on annual runoff in the Tarim River Basin, China. Quaternary International. 208:53–61. Yue,S., Pilon,P., Cavadias,G. 2002. Power of the Mann-Kendall and Spearman’S rho tests for detecting monotonic trends in hydrological series. Journal Hydrology. 259:254–271.